We have a small raised bed garden here at Ravenscourt. Running a small business keeps us very busy. But we wanted to test our cinder block raised beds ourselves to make sure they work the way we intend. We were pleasantly surprised to find it doesn’t take much time to grow some of our own food. It might be my imagination but I think it tastes better too. Here is the long shot! Growing food in our heavy clay soil can be difficult. We learned from Dr. Bob Randall in a class we took through Urban Harvest about the use of raised beds for growing food. 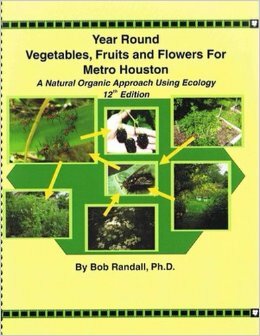 We highly recommend his book Year Round Vegetables, Fruits and Flowers for Metro Houston (A Natural Organic Approach Using Ecology). You can still by used copies via Amazon. Urban Harvest’s vegetable gardening classes are great for novice and experienced gardeners! There are many ways to construct raised bed using different materials. We like to mortar ours and reinforce the corners with Rebar. This way they make a nice stable wall you can sit on. Here is an example that I posted about earlier. This is great for weeding and extra seating when used next to an entertaining space. Watering troughs make great raised beds! And are easy to install. 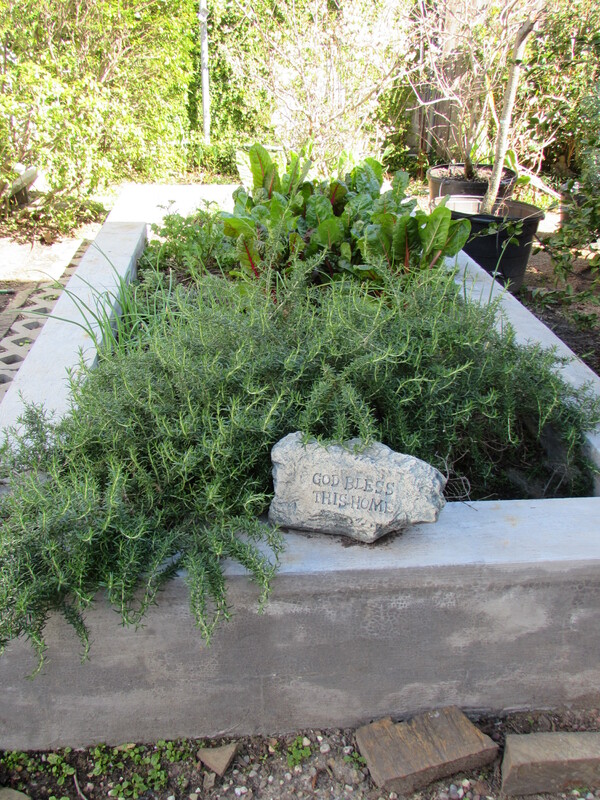 Trailing rosemary make good border plants in beds and is drought tolerant once established. We trim the tops to cook with. We have rosemary year round at one end of the bed. Right behind we have onions that we have used young but are also letting some get plump. They are planted a bit haphazard because they were dug up by our dogs and then sort of patted back in. There are grass blocks down the one side to make it easier to walk when it gets too wet. The other side has compacted decomposed granite because it is butted up to the tree holding area and driveway were we park our big work trailer. Rainbow Swiss chard, beautiful and tasty. Swiss chard is by far our favorite crop. Here in Houston it is a wonderful hearty winter crop. It looks nice planted in flower beds with annuals and perennials. It made it through all the hard freezes we had this last winter with no problem. We are busy trying to eat it up before it craters in the coming heat. There is some arugula left but it did go to flower and we have cut it back to see what it will do. I didn’t care for it much but Shawn did : ) There are a couple of cabbages. The rest are herbs; oregano, dill, thyme, sage and basil. The bed gets morning and some mid-day sun but the house shelters it from the hot afternoon sun. 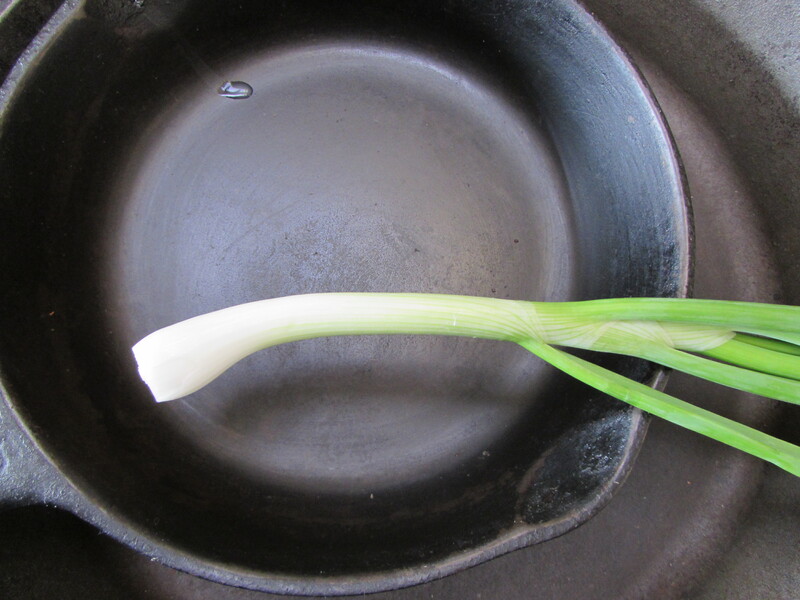 Green onion ready to be sauteed. Because March was cold and April unusually cool everything still looks great. So we are hesitant to pull it out and plant a summer garden. That is fine because then we can wait till later August and put in our Fall garden. Being outside in July in Houston can be miserable. Perhaps I can get some tomatoes going in buckets and then put them in the bed. Swiss card fresh from the garden and ready to steam. I can say after so much success with so little effort, I wish we had room for more beds! 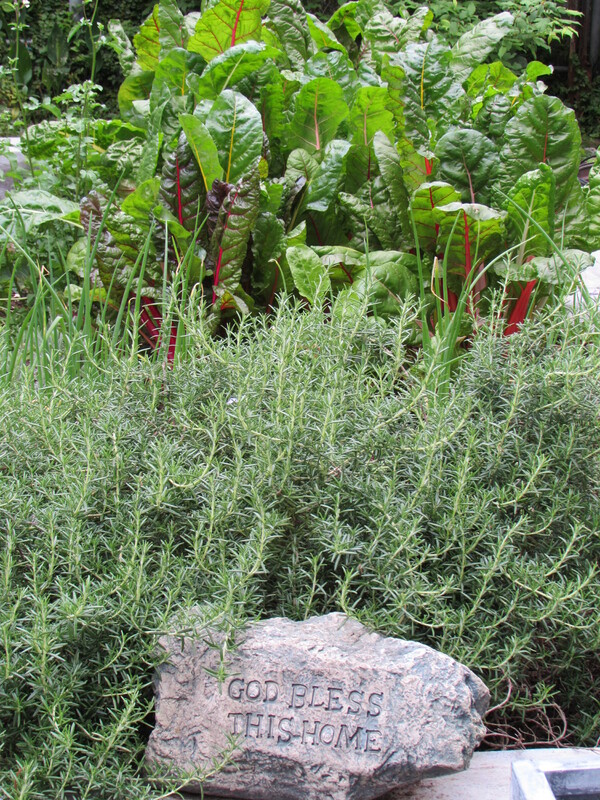 What food are you growing in your garden? 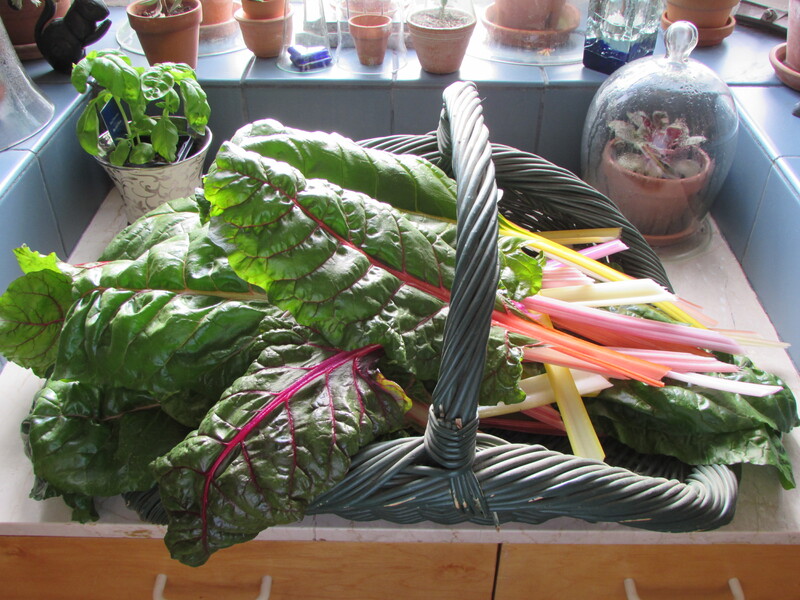 Rainbow chard is fabulous stuff. And Rosemary is one of my favourite herbs – I love it, and so do the bees…. I have just been making raised veg beds here and I am delighted with them. 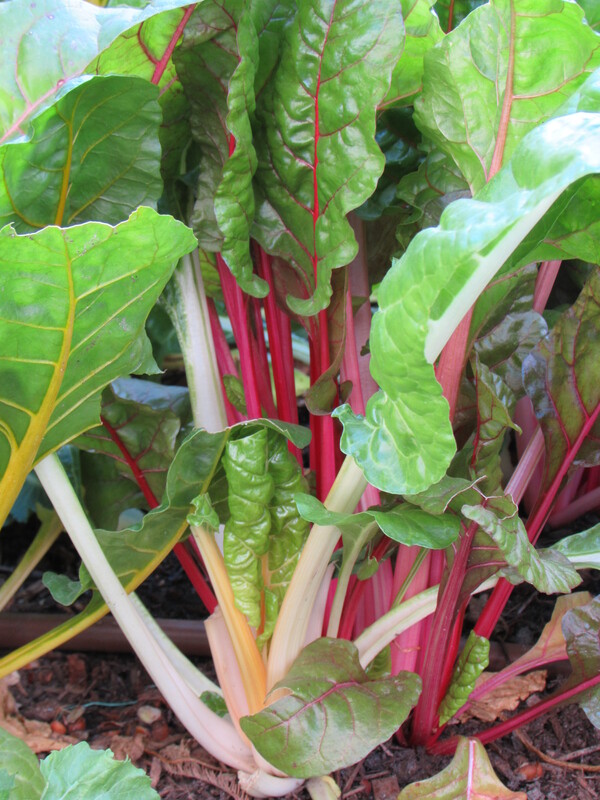 I grow Rainbow Chard too. So easy and it goes on and on.